injured a full and speedy recovery. of the cyclone IDAI embody what we truly stand for as a nation. of the damage has been completed. 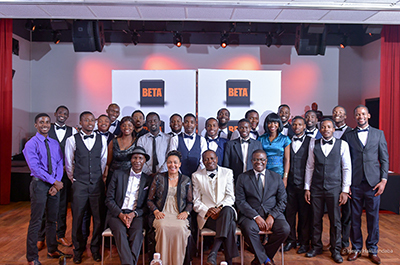 In 2016 Beta Holdings launched the Architectural Students Competition, which culminated in the announcement of the winners at a prize giving gala dinner held in Avondale on the 23rd of September. The competition is now billed as Zimbabwe’s premier architectural event, which highlights the creative and technical talent of the cream of Zimbabwe’s architectural students. The competition is borne out of a realization that there are very few avenues currently available for students to showcase their talent, with almost all architectural students leaving the country for better opportunities. Our hope as a company is that through this platform, we can not only show the students that there are ample opportunities within the country, but also bring together key industry partners to experience first hand the talent we have locally and create employment opportunities. The future building landscape is dependent on retaining these key skills locally. The competition, which is held in partnership with the Institute of Architects of Zimbabwe and the National University of Science and Technology Faculty of the Built Environment, is a tribute to arguably Zimbabwe’s greatest architect and first black architect, Vernon Mwamuka. The late Vernon Benele Mwamuka, whom the winning award is named after stands out as one of the most prominent architects the country has ever produced, who left a very unique aesthetic impact on the immediate environment, revitalising the surrounding urban expanse as in the case of the Kopje Plaza (West of Harare’s skyline). He is credited as being one of the driving forces behind the call to establish a school of architecture in Zimbabwe- a dream realized through the establishment of the school of architecture at NUST. To this end, the winning student each year is awarded the Vernon Mwamuka shield in recognition of the late architect’s sterling contribution in the field of architecture in Zimbabwe. A panel from the Institute of Architects develops the competition brief for the Student’s based on an existing challenge that any one architect may be working on. The student’s work under the guidance of an architect in developing the architectural solution which must incorporate bricks and concrete roof tiles as sustainable and economically viable building materials. The winning drawings are currently archived at BETA Holdings, with the long term vision being to find partners and investors who are wiling to take these projects further and turn them into a reality. The Overall winner, of the Prestigious Vernon Mwamuka Floating trophy, Tinotenda Nyamukapa walked away with $2000.Prince Benny Chipadza won the first prize from Polythechnic College and walked away with $2000 as well. The first runner ups from NUST and Polytechnic College, Muranda Titus and Takura Kadembo received $1500 each, and second runner ups, Thengisani Zhou walked and Roamello Ngwenya walked away with $750 each respectively. Our Logistics fleet keeps getting bigger, so we can serve you even BETA! We’ve introduced new Mercedes Actros trucks with capacity to carry smaller loads and navigate even rougher terrain. And new MAN tipper trucks to improve our mining operations. Have a look at a few of our new additions. Beta Holdings (Pvt Limited is a leading manufacturer of clay bricks, concrete roof tiles and other related products. Located in the Mount Hampden area where clay, the major raw material in brick manufacturing is locally available. Beta Holdings is the first clay brick manufacturer and concrete roof tile manufacturer in Zimbabwe to attain ISO certification for ISO 9001:2008, ISO 14001:2004 and OHSAS 18001:2007 systems at once which shows our continued commitment to excellence. The organisation has grown from strength to strength over the years. The need to provide the utmost safe and healthy work environment for the employees that leads to production of quality products and services led to the birthing of a management system within the organisation. The pillars of the management systems being: SAFETY, HEALTH, ENVIRONMENT AND QUALITY, gave insight and direction to the implementation of an integrated management system. An integration of the quality management system ISO 9001: 2008, Environmental management system ISO 14001: 2004 and OHSAS 18001: 2007 was then implemented in the organisation. The result is a wholesome package for the employees, the customers and the various stakeholders. The road……………… The journey to certification began in 2012 for Beta Holdings when the issue was discussed at the strategic meeting. Integrating the system meant all three systems got equal attention when one wanted to make a decision. The documentation was easier as we had to incorporate the requirements of all three systems at once. The challenge we faced was getting staff to embrace the documents required for all the three systems at once but through hard work and training, the Project Team was able to overcome this challenge. The system was not easy to implement, but it was worth it as we have created a structure by which we can analyse our own decisions and document best practices. This helps us to ensure that our internal operations run smoothly and efficiently, which is vital in the current operating environment. The certification…………….By achieving OHSAS 18001:2007 Certification, the organisation has demonstrated its commitment to identify risks and actively reduce them to the best of our ability. ISO 9001:2008 Certification for the organisation demonstrates the commitment of the organisation and the work to ensure quality bricks, tiles, delivery and all support services. The focus is utmost quality, customer satisfaction, traceability and continuous improvement. Beta Holdings is committed to the sustainable management of natural resources and protection of the ecosystem. ISO 14001: 2004 clearly requires defining and establishment of controls to reduce the organisation`s impact on the environment in its everyday operations. Certification therefore provides assurance to our stakeholders that we own up to our commitment as outlined by our SHEQ Policy to prevent pollution, a minimisation of waste and efficient use of raw material and energy. In line with our policy statement our aim is to make quality products to satisfy the requirements of our customers whilst ensuring a healthy and safe environment for our employees and taking care of our environment. Our Beta clay bricks are a durable and versatile building material for walls, patios, and other structures. Given the long-lasting nature of bricks, buyers should be sure to get the most out of this investment by choosing the right bricks for the job. One of the most important things to consider when buying bricks is to match the brick to where it will be used. Another important tip involves picking the right type of brick for structural, decorative, or ground work. Finally, buyers should consider the appearance of the brick, including its profile, colour, and numerous other aesthetic properties. The biggest mistake one can make when buying bricks is choosing the wrong type of brick for the job. Indoor bricks used in an outdoor patio are destined to fail, resulting in wasted time and money. Interior-grade bricks should only be used indoors, and builders should stick with specially crafted fire bricks when constructing a fireplace or fire pit. Another mistake buyers make is purchasing bricks that are not SAZ (Standards Association of Zimbabwe) certified, and SAZ certification means that the product has been certified in terms of safety an reliability and gives a guarantee that the product is being manufactured under an effective system of testing, control and monitoring and provides protection against inferior or sub-standard products. To ensure the brick will fit the project, people buying bricks should look for units meant for specific types of applications. For example, bricks with holes cut through the centre are known as structural bricks, and are used for constructing interior or exterior walls. These holes reduce the weight of the brick in applications where the top of the brick will be hidden from view. Our Beta ‘load-bearing’ bricks are highly recommended as foundation bricks or for other load bearing construction. Beta bricks’ strength in terms of moisture resistance and compression is un-paralleled and this is important as this is a key the pillar of construction. Beta ‘pavers’ are designed for patios, walkways, and other hardscapes. When buying bricks, homeowners have a wide variety of options in terms of colours, textures, and finishes at Beta, we have a wise array that suit any and all needs. When attempting to match existing brick, it’s best to take a sample along for comparison. Given the different types of brick sizing, it is very easy to purchase a standard brick size, then realize that the existing bricks don’t match. Even slight variations in colour can be hard to spot without a sample on hand. Brick and mortar colour, size, texture, and type of bond, will all impact on the aesthetics of the brickwork. This will also dictate what ‘type’ of brick you choose. Beta bricks are made of clay: clay is an efficient, cost-effective and sustainable option for modern construction, its natural properties provide complete, long-term sustainability, not only offering increasingly sophisticated low-carbon product manufacture, but giving a building life of up to 150 years with little or no maintenance. Beta Logistics delivers your bricks in state-of-the art gps-enabled trucks-packed in pallets to ensure your bricks are secure, arrive undamaged and on time. Customers must make sure that the batches are stored on a hard standing to avoid bricks collapsing. The appearance of brickwork will be primarily down to the pattern in which the bricks are laid, also known as ‘bonds’. The style of home you are building will depend on the type of bond you select. to. At Beta Holdings, we aim to please our customers. Having carried out extensive research in early 2012, we know what you, our customers, want and need from us in order to have a satisfying experience. The third quarter, will see a breath of fresh air blowing through Beta Holdings in our everyday operations, as we make adjustments and improvements for all our stakeholders both internally and externally. With so much happening all the time, we wish to announce to you, two of our current projects: The launch of our logistics division and the unveiling of our new cleaner modern logo. Today is an extremely proud day for all of us at Beta, a new day for us all. We are excited to announce the Beta Logistics Division. We are in the final stages of creating this new exciting venture. The Beta Logistics Division will be ope ating in the third quarter of 2012, yet another move forward to ensure that all our business operations are seamless and meet our customer needs and expectations. Efficient, high quality, cost effective products and services.